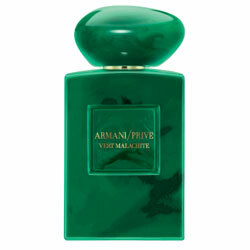 Vert Malachite by Giorgio Armani - A floral perfume for women and men. 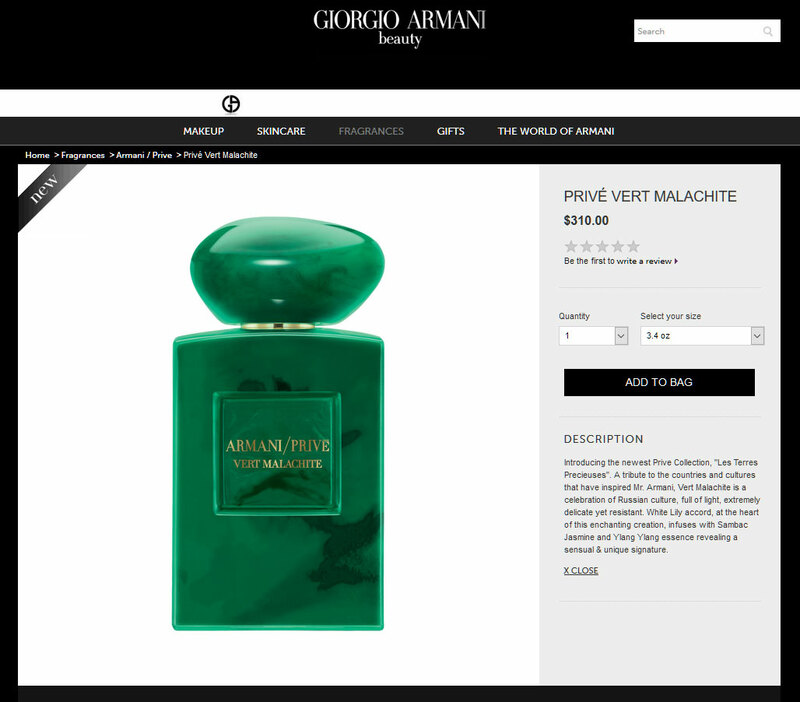 This scent is part of the Les Terres Precieuses Armani Prive collection. An elegant and feminine fragrance inspired by the Russian culture featuring notes of white lily, sambac jasmine, and ylang ylang. Available in an eau de parfum spray from Neiman Marcus. Package Design Stone bottle and cast resin cap designed to resemble the green malachite stone with gold accents. "Introducing the newest Prive Collection, 'Les Terres Precieuses'. 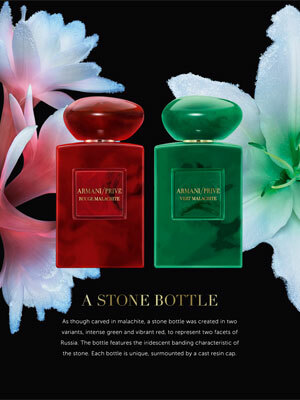 A tribute to the countries and cultures that have inspired Mr. Armani, Vert Malachite is a celebration of Russian culture, full of light, extremely delicate yet resistant. White Lily accord, at the heart of this enchanting creation, infuses with Sambac Jasmine and Ylang Ylang essence revealing a sensual & unique signature. 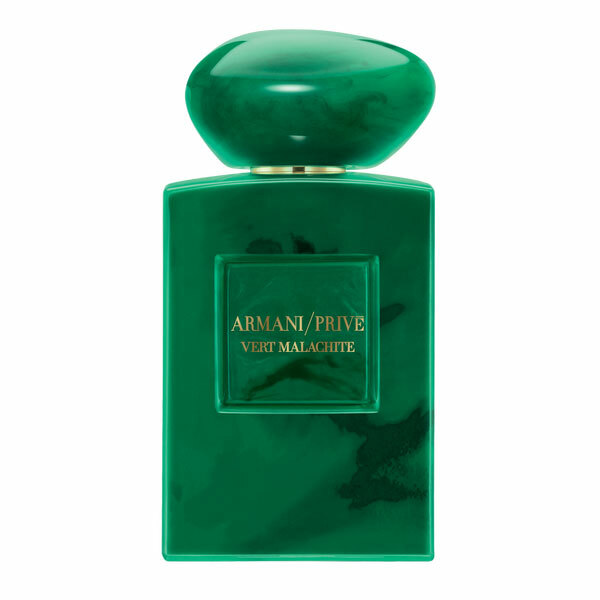 "Vert Malachite reveals a very feminine sensuality. A delicately balanced floral fragrance, it is both fresh and intoxication, leaving a soft yet lingering trail. Diamonds used to be a girl's best friend, but these days, I'm green with envy for this badass member of the mineral and gemstone kingdom. Known for its sumptuous banding and rich tones, some of the most famous malachite hails from Russia, where it has been used for centuries to make ornate jewelry and to decorate the decadent palaces of the czars. 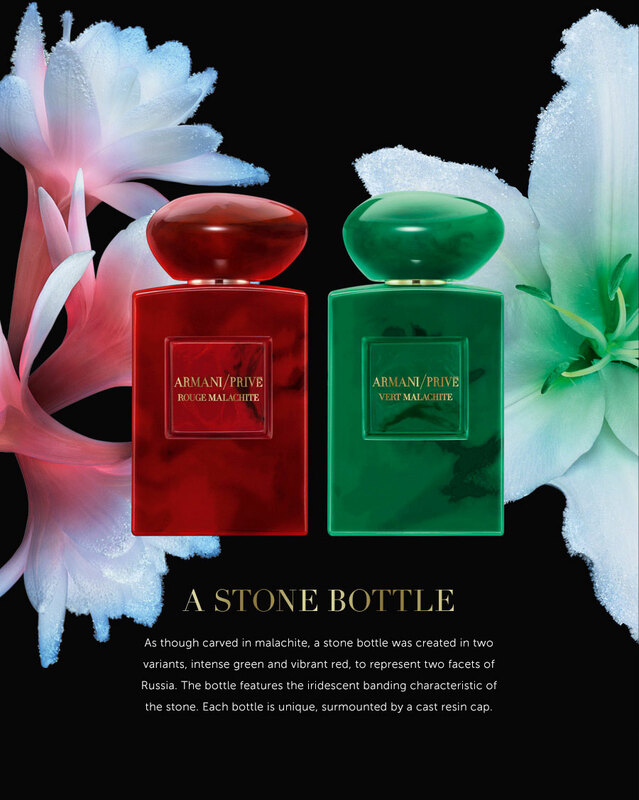 This exotic heritage inspired Giorgio Armani to create two new fragrances: Vert, a lily-hearted homage to the stone, and tuberose-infused Rouge, dedicated to the strong women of Russia. Now if only I had some awesome jewelry to go with my favorite new scents. Valentine's Day gift, anyone?